Have you ever stared at a spider web amazed (and maybe terrified) at how spiders build these strong and yet delicate structures? But even though all spiders produce silk, not all build orb-shaped (circular) webs (Fig. 1C,D). Tarantulas and their kin, for example, use their silk to stabilize burrows and encase eggs (Fig. 1A), while jumping spiders use it to make safety tethers while jumping and to build “pup tents” for shelter (Fig. 1B). But at some point in the evolution of this fierce group of predators, some spiders developed the ability to build round webs that are extremely successful at capturing flying insects (Fig. 1C,D). This group of spiders then diversified into many species (comprising 28% of the living diversity of spiders) and until recently was known as the Orbiculariae. For more on spider silk, check out Cheryl Hayashi’s TED talk! Because of similarities in the shape of the webs and in the web-building behavior of orb weavers, they were believed to have a single origin, meaning that they are a distinct group of spiders with an exclusive common ancestor (also known as a monophyletic group; also see phylogenetic terms glossary) (Fig. 2, left). An alternative hypothesis suggested that orb webs evolved more than once, with evidence coming from phylogenetic studies based on a handful of genes. Because of lack of resolution and mixed results often presented by those studies, and due to the similarities between orb webs, this hypothesis has often been dismissed. Figure 1. Spider representatives from different groups. (A) Tarantula Haplopelma lividum (Mygalomorphae) with eggsac (West 2014, with permission). (B) Jumping spider (RTA group) (Anker 2010, with permission) (C) Typical orb weaver Argiope sp. (Araneoidea) (Gallice 2012 Wikimedia). (D) Hackled orb weaver (Deinopoidea) (Anker 2011, with permission). However, the improvement of molecular techniques has enabled us to build more robust evolutionary trees based on the sequences of hundreds to thousands of genes. Two independent studies using genomic data have just found strong evidence that orb weavers do not form a monophyletic group (Fig. 2, right). The authors based their conclusions on comparisons of transcriptomes, which are the set of genes transcribed from DNA to messenger RNA (mRNA) in an organism. They first extracted mRNA from different species of spiders and converted them to DNA (a more stable molecule). The DNA was then sequenced and ordered in such a way that the same genes were compared across all species. Finally, these sequences were used as data for phylogenetic analyses that built the trees representing spider evolution. This approach yields large amounts of data for many species, but we must be careful in how we interpret it. For example, not all genes are being transcribed in all organisms at the same time. The result is that each dataset is missing some amount of data: a few genes are present in all samples and many genes are missing from a few species. For that reason, authors in both studies divided their datasets into smaller parts with increasing completeness (from 2637 genes in the largest matrix to 94 in the most complete) to detect potential effects of missing data in the results. Fernández et al. (2014) took some additional precautions, such as building separate trees with groups of genes that change at different rates (some genes suffer mutations more often than others). Both studies further tested how much conflict exists among trees made from individual genes. Different genes may tell different stories, but we expect that by using many genes we can overcome the noise and capture the true history of the species. Nearly all of these analyses agreed that orb weavers are not a monophyletic group. Figure 2. Phylogenetic trees showing (left) traditional view of the relationships among spiders and (right) new paradigm of spider evolution based on two new genomic studies, Fernandez et al. (2014) and Bond et al (2014). The old grouping (left) put together all orb weavers in the group Orbiculariae based on similarities of web architecture and web-building behavior. 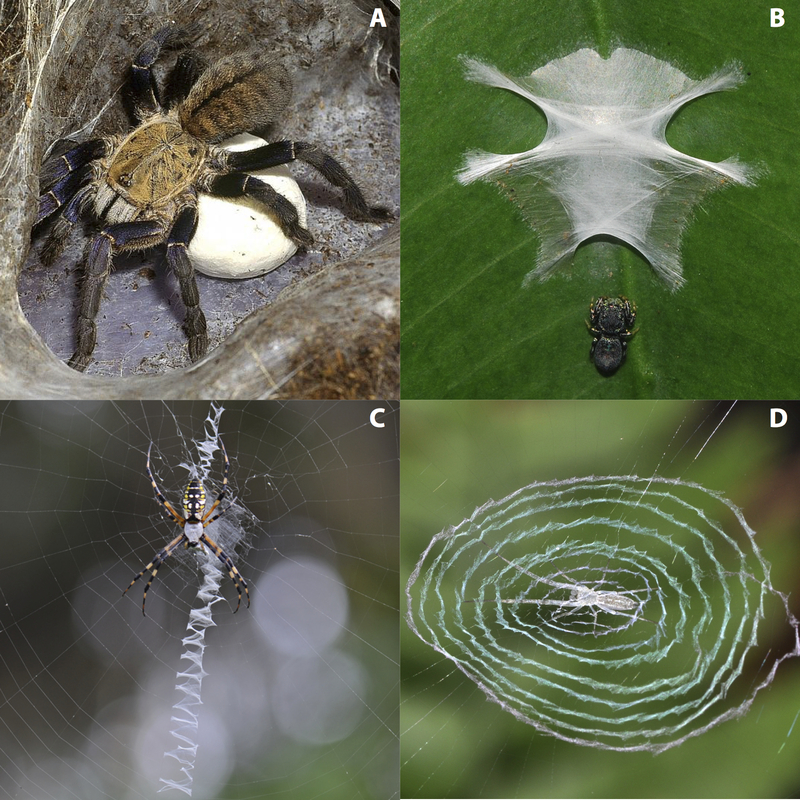 New data based on hundreds to thousands of genes (right) show that Deinopoidea orb weavers are more closely related to the RTA group, composed mostly of webless spiders, than to other orb weavers (Araneoidea) (check Figure 1 for photos of main groups). Each cartoon represents the name below it, except for the top one, which represents all orb weavers (Araneoidea and Deinopoidea). Cartoons by Bond et al. What does all of this mean for the spider phylogeny? Basically, we have just discovered that there are two separate lineages of orb weavers: the Araneoidea, which includes typical orb-weaver spiders, sheet weavers, golden orb-weavers, cobweb spiders, long jawed spiders and ray spiders (Fig. 1C); and the Deinopoidea, which includes hackled orb weavers, ogre-faced and net-casting spiders (Fig. 1D). Deinopoidea spiders are more closely related to a group consisting mostly of webless hunters (the so-called RTA group; Fig. 1B), than they are to Araneoidea spiders (Fig. 2, right). The two groups of orb weavers build geometrically similar webs (Fig. 1C,D), but there are several differences. For example, deinopoids produce a metabolically expensive dry silk, while araneoids produce webs with a more extensible and sticky silk and in a faster and more economical way. These relationships allow two possible scenarios for the evolution of spider webs: either (1) orb webs evolved independently in Araneoidea and Deinopoidea or (2) the orb web appeared only once, earlier in the spider lineage (in the ancestral of all Entelegynae; Fig. 2, right) and was later lost in non-araneoid and non-deinopoid spiders. Bond et al. (2014) used the phylogeny and knowledge about the sampled groups to reconstruct the state of webs in ancestral spiders. Their analysis supports the second scenario, which seems plausible in light of the similarities in web building. If this is indeed the true history of orb webs, then we expect to find morphological and genetic evidence of the ancestral origin of orb webs in spiders that would have secondarily lost orb weaving (e.g. webless RTA group). But the differences in their silk and the fact that many related lineages of spiders are yet to be sampled make it too early for final conclusions. A much denser sampling of spider species will improve our understanding about their common ancestor, which will help to tease these hypotheses apart and hopefully untangle the mystery of how spiders gained their webs. Tauana Junqueira Cunha is a PhD Student in the department of Organismic and Evolutionary Biology at Harvard University. Andrew and I both loved this article!